Peter Kurth (1995) (英語). Tsar: The Lost World of Nicholas and Alexandra. Little, Brown & Company. ISBN 978-0316912112. Charlotte Zeepvat (2004) (英語). The Camera and the Tsars: The Romanov Family in Photographs. Sutton Pub Ltd. ISBN 978-0750930499. Peter Kurth (1983) (英語). Anastasia: The Riddle of Anna Anderson. Little Brown & Co. ISBN 978-0316507165. Sergei Mironenko; Andrei Maylunas (1997) (英語). A Lifelong Passion: Nicholas and Alexandra: Their Own Story. Doubleday. ISBN 978-0385486736. Greg King; Penny Wilson (2003) (英語). The Fate of the Romanovs. Wiley. ISBN 978-0471207689. Manfred Knodt; Vladimir Oustimenko; Zinaida Peregudova他 (1997) (英語). The Romanovs: Love, Power & Tragedy. Bookworld Services. ISBN 978-0952164401. Hugo Mager (1998) (英語). 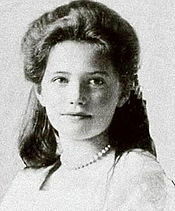 Elizabeth: Grand Duchess of Russia. Carroll & Graf Pub. ISBN 978-0786705092. Ian Vorres (1965) (英語). The Last Grand Duchess: Her Imperial Highness Grand Duchess Olga Alexandrovna (1 June 1882-24 November 1960). Charles Scribners. ASIN B001L4OJ9M. Helen Rappaport (2010) (英語). The Last Days of the Romanovs: Tragedy at Ekaterinburg. St. Martin's Griffin. ISBN 978-0312603472.